It is a noisy forceful inspiration of air through the nose resulting in a strange snorting sound. When seeing a reverse sneeze for the first time it can be quite a startling event for owners who often think their dog is choking or even struggling to breath. During an episode of reverse sneezing the dog will often stand still, with elbows pulled away from the body, head and neck stretched out straight, with a backwards head motion, mouth closed and lips sucked in making a loud strange snorting sound. Their eye may even be bulging adding to the shock of an owner witnessing this. These episodes may last from seconds up to a few minutes. Although reverse sneezing can be startling to observe there is no real risk to the dog and they are generally normal after the episodes. Something to remember is that some dogs may even reverse sneeze throughout their lives with no untoward effects. This may be confused with the goose honking cough noted in tracheal collapse, a common condition in certain small breed dogs. It can also be confused with stertor which is commonly associated with activity and excitement; snoring occurring during sleep, and retching and gagging involving expectoration involving an open mouth. Another common condition it may be confused with is Kennel Cough with the major difference being that Kennel Cough causes a dry honking cough usually ending up with an open mouth gagging or retching at the end of the episode (as if there is a bone stuck in the dog’s throat), whereas with reverse sneeze, the dog’s mouth tends to stay closed and it is almost like they are trying hard to swallow something, which just does not want to go down the throat. Kennel cough is caused by a number of difference viruses and bacteria and is usually a condition which will clear up over time and disappear completely, whereas reverse sneeze often seems to be a lifelong condition. If these episodes are something that happen frequently, are concerning for you, or seem to distress your pet, it is better that you take them to the vet for a proper clinical examination. 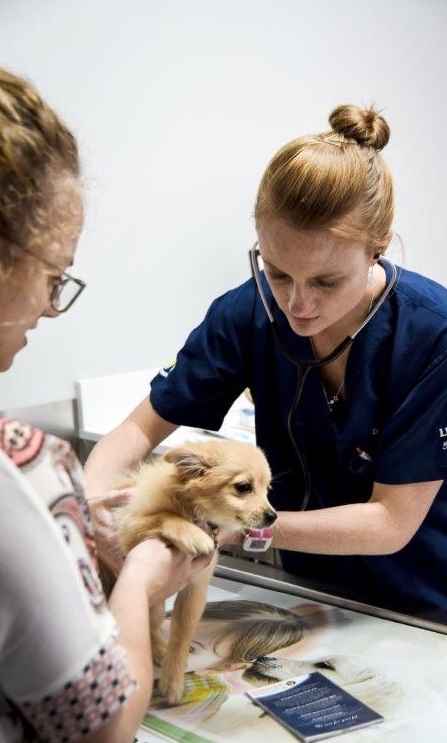 Generally, the veterinarian will attempt to determine the cause of the symptoms by doing a thorough work-up which may include the consideration of the age and breed of your dog, a good history of the condition and the clinical signs seen, a full clinical examination from nose to tail, a nasal work up (X-rays, flush, biopsies etc. ), endoscopy (with sample collection and visualisation) and response to treatment trials. The extent of the work-up is determined by clinical signs, frequency of episodes and your willingness as an owner to go through the process. A very important point to remember is that often despite the best attempts and in-depth work-ups, a final answer or underlying cause may never be found. This may be in part because this condition may have a behavioral component to it. Please read below under Causes for more information. There are a number of other conditions affecting the throat, the heart and the lungs, which may mimic reverse sneeze and therefore it is important to rule out these conditions, as some of them may end up being life threatening and ignoring the symptoms and merely saying that it is a behavioral problem, may be too simplistic. So what may be some of the possible causes? The consensus, given current knowledge available on this conditions, seem to indicate that this is a response by the body to some form of irritation of the upper respiratory tract. These can include rhinitis and sinusitis, which is an inflammation of the tissues of nose and sinuses. The cause of the inflammation may be infectious (bacteria, viruses and fungi), environmental (dust, irritant aerosols, cleaning agents, grass awns and seeds etc.) and allergic conditions, where it’s the body’s over response to normal environmental contaminants that causes the problem. Other causes may also be eating or drinking too quickly, pulling on the lead around the neck, and even excessive excitement. Even excessive vomiting may cause inflammation of the nose and throat. Tumours of the oro- and nasopharynx (mouth, nose and throat) and even severe dental disease may be the reason behind reverse sneezing. Excessive vomiting may also cause inflammation of the nose and throat. The behavioural component or cause of the condition is not yet well understood but there seems to be a school of thought which says that the condition starts as a result of one of the reasons above and may have been self-limiting, had it not been for the fact that the concerned pet owner immediately pays attention to their dog during one of these episodes, which lead to some form of attention seeking behaviour from the dog with future episodes. It is unlikely to be completely voluntary (i.e. the dog “taking its owner for a ride”) but it does seem like the concern an attention shown to a dog during some of these episodes may perpetuate the problem and cause it to recur. If other pathological causes for the condition have been ruled out through a proper clinical workup by the vet, it may actually be of benefit to ignore the dog during these episodes and not make a fuss of it at all. Please discuss this with the vet before you assume this is the case with your dog. In general there is no specific treatment for reverse sneezing and in most cases no treatment is required. During the episode it helps to calm your pet, stroke them gently on the head and neck in an attempt to calm and sooth them. As mentioned previously these episodes often resolve on their own with no complications and ignoring an episode may in actual fact be a better treatment that to hold and stroke your pet and talk to them. Treatment deals with the underlying cause, if it can be found. Response to treatment is often used by the vet as a cost effect diagnostic tool for the more common reasons for reverse sneezing. Treatments prescribed by the vet may include anti-inflammatories, steroidal treatment, antihistamines and even decongestants. If a specific cause is found more direct treatments may include, dental therapy, antibiotics, or even surgery.